Review by Phil Tann for Ausdroid. Like a lot of folk, I use a messenger bag daily to carry my electronic goodies around with me. Because circumstances have changed, I decided that it was time to look for a new carry bag. I came across the Booq Boa Nerve, and it may be the next bag for me. 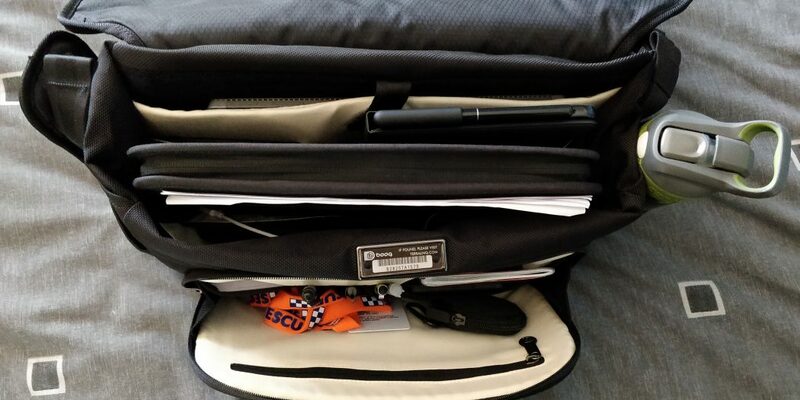 I’ve used a Booq bag in the past, and I knew the quality wouldn’t be an issue. For me, it’s more a question if the layout was going to be suitable. With this in mind, I got my hands on one to take a look. For a messenger style bag this is really spacious. I can fit everything from my backpack (and more) in there easily. The interior is really well designed, not just as a dumping ground for the day to day goodies you may need to carry. A multitude of pockets in varying sizes allow you to keep your goodies organised and separated as needed. The outer shell if the bag is a heavy duty, water resistant nylon that will endure over time. It’s taken quite a beating (daily life with me…) during this review and hasn’t got any real marks to show for it. Probably far more importantly than the exterior (wear and tear is really normal for daily use bags like this) is the interior, the padding and the protection if offers your electronics. There’s significant padding in the laptop compartment which offers plenty of protection and it’s appropriately sized to cater for anything up to a 15-inch laptop. Perhaps the main criticism I have would be the lack of cable management internally, but (in my experience) messenger bags aren’t really suited to that style of cable management. There’s plenty of pockets to cater for your goodies and a power bank in the main compartment of the bag, then you can simply plug in as needed or even have the charging device in the same pocket as your power bank. I’ve taken the Boa Nerve for a couple of short rides and once I got the straps adjusted properly for me, I’m absolutely certain that this would be an outstanding bag for a bike commuter. The straps are really wide and the shoulder padding is extremely comfortable, my main concern would be how hot you’d get with this on your back but that’s true of any bag. The straps is the other clear area that needs a bit of work, not because of comfort or other usability faults but simply in the magnetic buckle needing a better quality finish. Even taking extreme care with it as we do with all review units at Ausdroid, there were little flecks of paint taken from the buckle after a few days of use which detracts slightly from the presentation of the bag. When you take a closer look at the features of the Boa Nerve, there’s heaps in it that aren’t immediately obvious. The top flap that covers the main compartment has reflective stripping in it to ensure you’re visible at night. 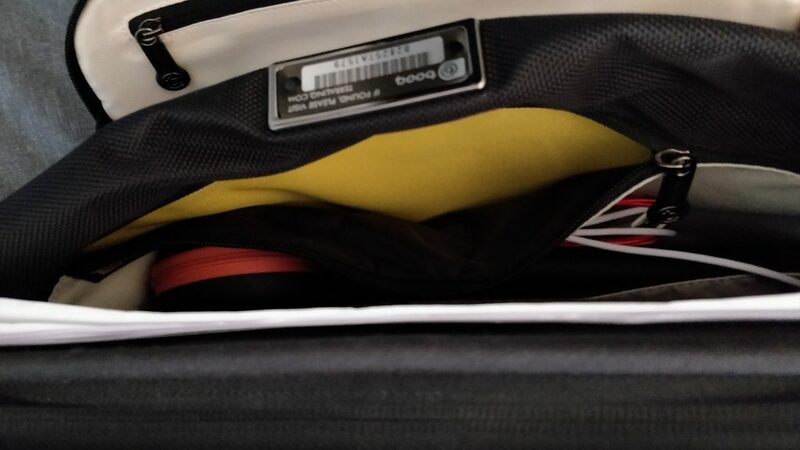 For cyclists, U Locks fit in the side mount easily and the interior has an off grey stripe to ensure that even small items right at the bottom of the bag are visible easily. How does it go for everyday use? My day job has me in and out of the office a lot, so being mobile and able to drop and go quickly is very important. 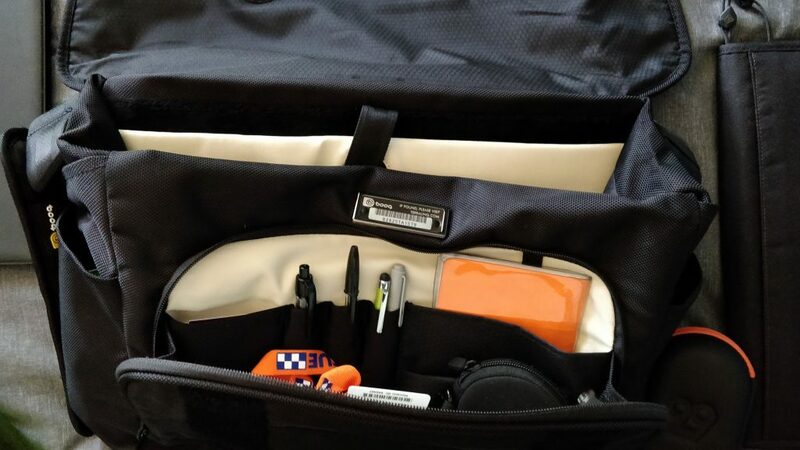 Easy access to pockets and being able to get my gear back in my bag quickly are key for a bag like this – the pocket layout is perfect for this. Despite everything I cram in on a daily basis, there’s still room to spare which leads me to believe that I could manage a day trip interstate, probably even an over-nighter from the one bag which is remarkably impressive. I particularly like the way that the bag naturally broadens when it’s got a larger amount of contents rather than looking baggy when it is partially empty. After a short time (about a week) of experimenting, I found the layout of my gear that worked really well with the Boa Nerve. It fits a heap of gear in there and there’s still spare room with my gear I carry on a daily basis. Frankly, at this point in time it’s an excellent bag for my needs and provided the messenger style of bag suits your needs, the Booq Boa Nerve is as excellent option. It has plenty of space, heaps of pockets and really well thought out design making it hugely functional for a wide range of users – particularly bike commuters and in comparison around the market, a very reasonable price. An RRP of AU$199 isn’t way out of the ballpark in terms of the competitors on the market, in fact it would be easy to spend two to three times as much without getting the same functionality delivered. The reality is that you get the quality you pay for when you’re buying bags, Booq have really good quality and that combined with the stylish look makes it an easy entry into the shopping list for many. They also walk on the right side of a fine line between quality, functionality and cost without stepping over the line into what would be considered premium pricing. Purchasing one around retail pathways isn’t the easiest task, you’ll probably need t you do a bit of research online as to who stocks them. In my quick online check you can find them at multiple online retailers ranging from $159.00 (on a particularly good special) through to and over the RRP of $199 depending on the retailer. What do you need from a bag when you’re packing your goodies for safe keeping? Phil bought the Booq Boa Nerve with a media discount and reviewed it for Ausdroid. All photos taken by Phil during the review period.